Craniosynostosis is a condition where different sutures in the skull close early, which causes problems with regular skull and brain growth. Nicholas Bastidas, MD, provides treatment for craniosynostosis in the Long Island and New York, NY, area. You want to identify craniosynostosis early, ideally so that treatment can be completed before the child turns one. This allows for the best response to the treatment, given the softness of the bones and other tissue. If you notice any of these signs, and particularly the combination of them, contact us and come to our office in the NYC area as soon as possible so that a medical professional can examine your child. Remember that craniosynostosis may be observed at birth or at some later time. Once it has been observed or you suspect that it is present, we perform final diagnostic tests to ensure that the diagnosis is accurate and that we understand the full extent of your child’s craniosynostosis. We typically use x-rays and CT or CAT scans of the head to confirm the diagnosis. These tests help us know precisely how to treat your child effectively and thoroughly. Our office recommends surgery to address craniosynostosis. Generally, we strive to perform the surgery when the child is between 3 and 8 months to ensure that they are grown enough to undergo the surgery and still young enough for the problems to be addressed. If you suspect that your child has craniosynostosis, come to Nicholas Bastidas, MD, in the Long Island area. Call (516) 497-7900 or (212) 485-0616 to schedule an appointment today. The sagittal suture runs longitudinally in the middle of the skull, and craniosynotosis can cause a head shape that is very long and narrow. The forehead and the back of the head (occiput) often bulge. If caught early (before the head shape is too deformed), removal of the fused suture and helmet therapy can lead to good outcomes. If late, typically two surgeries are needed to shorten and widen the skull, one for the back part and one for the front part. Fusion of the unicornal suture produces a characteristic head shape that is trapezoidal. 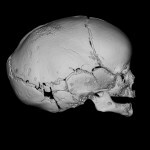 The forehead and eye socket on the affected side slope back, the back of the head flattens, and the other side often sticks out. The bones of the nose may slope towards the affected side and the chin often deviates to the opposite side. Surgery involves reshaping the affected bones, correcting the position of the eye socket, and restoring the shape of the forehead. The rarest of the craniosynostosis, A fused lambdoid suture causes a flattened back of the head with a large bulge behind the ear (mastoid). If 2 or more growth plates are fused the head shape can be severely deformed and place extreme pressure on the developing brain. Many syndromic craniosynostoses are multi-sutural and surgery is aimed at first relieving the pressure (by expanding the vault) and then by reshaping the bones. The gold standard and most widely accepted way for treating craniosynostosis. The bones of the skull can be reshaped and pressure relieved using an approach through a bicoronal incision hidden in your child’s hairline. Using the latest technology of resorbable plates, screws and sutures, the abnormal bones are contoured and repositioned to recreate the normal anatomy. Infants recover incredibly well from this procedure. This surgery is often performed between 6-12 months. A newer method of relieving pressure, typically in multi-suture synostosis involves lengthening the skull by applying devices known as distractors. Two small devices are placed on the bone edges which are slowly turned daily leading to the formation of new bone and expansion of the skull removing pressure on the developing brain. Craniosynostosis causes severe abnormalities in the shape of the growing skull causing inhibition of growth perpendicular to the affected growth plate (suture). To create room for the growing brain, relieve pressure, and restore the normal anatomy, the affected portions of the skull must be removed and remodeled. Typically is done by cutting, molding , and repositioning the cranial bones im a way to mimic the normal anatomy. The latest advances in 3D imaging and simulation now afford surgeons the ability to create precise (within 1mm) reconstructions that remove many possibilities of surgeon error and also reduce the effective operating time and anesthesia required. Dr. Bastidas has pioneered using 3D CAD/CAM technology to source the bone for the forehead reconstruction from the back of the head. Using bone from the back part of the head allow for almost perfect recreation of the normal anatomy using virtual models simulated from like age infants. Dr. Bastidas constantly pushes the envelope to incorporate the latest in technology and offer the best outcomes for your infant child.